Despite the arrest of two Iranian terrorists and the manhunt for a third, Iran has denied any link with explosions in Bangkok and accused "elements linked with the (Israeli) Zionist regime" of being responsible, state TV said on its website on Wednesday. Foreign ministry spokesman Ramin Mehmanparast rejected "the accusations by the Zionist regime of implication (of Iran)", accusing Israel of "trying to harm the friendly and historic relations between Iran and Thailand." "The Islamic Republic of Iran believes that elements of the Zionist regime are responsible for this crime and is prepared to help and cooperate with the Thai government to shed all light on these events," he added. Meanwhile, a Thai official said the Iranian suspects behind the failed attack in Bangkok aimed to assassinate Israeli diplomats. The explosions in Bangkok on Tuesday came a day after bombers targeted Israeli embassy staff in India and Georgia, with a female diplomat seriously wounded in New Delhi, in attacks Israel said were orchestrated by Iran. 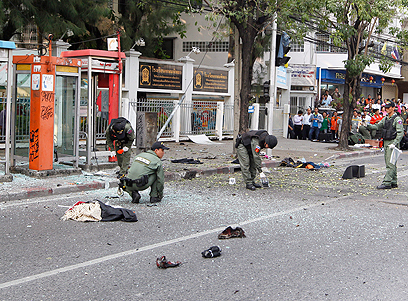 One of the Iranian suspects - named as 28-year-old Saeid Morati - had his legs blown off as he hurled an explosive device at Thai police while fleeing an earlier blast at a house in Bangkok on Tuesday, officials said. "These three Iranian men are an assassination team and their targets were Israeli diplomats including the ambassador," a senior Thai intelligence official told AFP, speaking on condition of anonymity. Thai bomb squad experts were called out to the Sukhumvit Road area in the east of the city in response to an apparently unintended blast at a house rented by an Iranian, after which three men were seen fleeing, authorities said. Authorities detained a second Iranian man trying to board a flight out of the country while the third suspect is believed to have fled to Malaysia. Explosives and magnets were later found inside the partially destroyed house, police said. Individuals appeared to be the target of the botched plot as the devices were not powerful enough to cause large-scale damage, said Thailand's National Security Council chief Wichean Potephosree. "Yesterday's incident was caused by current international tensions in world politics," he told a news conference. "It's happening not only in Thailand but also elsewhere. Thailand's weak point is that we are an open country to help our economy so I urge all Thais to be vigilant and inform the authorities if they see anything suspicious." Bangkok has been on the watch for a terror attack since police last month charged a Lebanese man suspected of planning a strike, following a US warning that tourist areas might be targeted. Thai authorities alleged the Lebanese man had links to Hezbollah, an Iranian- and Syrian-backed Muslim Shiite group that is blacklisted as a terrorist organization by Washington. Israel was quick to accuse Iran of involvement in Tuesday's blasts in Bangkok. "The attempted attack in Bangkok proves once again that Iran and its proxies are continuing to act in the ways of terror and the latest attacks are an example of that," Israeli Defense Minister Ehud Barak said. The blast in New Delhi blew up a car, critically wounding the Israeli diplomat and her Indian driver. In Tbilisi, an Israeli embassy employee found a bomb on his car and contacted police who were able to defuse the device before it detonated, according to Georgia's interior ministry. Thai police said they had found no direct link between Tuesday's bombings and the earlier threat but had received a separate warning from intelligence sources about a potential new attack. The United States condemned the Bangkok blasts and voiced concern about a worldwide "uptick" in such violence, including some with alleged links to Iran. "We're concerned about it. Some of these (attacks) have been linked to Iran," State Department spokeswoman Victoria Nuland said. The Bangkok blasts are another blow to the kingdom's tourist-friendly image, which was badly dented last year by devastating flooding across much of the country, as well as rounds of rival political protests in recent years. Israel's ambassador to Thailand, Itzhak Shoham, said he believed the attacks in Bangkok, Tbilisi and New Delhi were linked. "We discovered some similarities – explosives that were similar to those used in India and Georgia, so we assume the same network was behind all the attacks. Of course we believe Iran is behind this," he said. See all talkbacks "Thai official: Iran terrorists targeted Israeli diplomats "